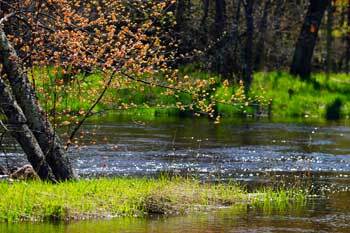 The Pere Marquette River system includes some of the finest trout waters in the nation. The spring and fall spawning runs of steelhead and salmon, the resident brown trout and "brookies" make this river extremely popular with the fishermen. The Middle Branch contains a sizable brown trout population. The bottom is generally gravelly and from the last weekend of April through May, steelhead are the number one target. The Little South Branch is another excellent trout stream along with its two major tributaries, McDuffee Creek and Pease Creek. The Big South Branch generally is of a different character than the other streams in the Pere Marquette system. Considered only a "fair" trout stream, the waters are usually warmer and slower. Ruby Creek enters the Big South in northeastern Oceana County and provides an excellent nursery stream and offers a good brook trout fishery. The Baldwin River originates in the expansive Baldwin-Luther Swamp northeast of the Village of Baldwin. Brook trout are abundant in the upper reaches. Cole Creek joins the flow about five miles northeast of Baldwin and provides some excellent coldwater spawning grounds for browns and steelhead. Below Cole Creek, large browns are found. Another tributary of the Baldwin River is Sanborn Creek which is one of the better brook trout streams in the area. The Pere Marquette mainstream begins at the "Forks" of the Middle and Little South Branches, about 1/2 mile east of M-37. In 1970, the mainstream from M-37 downstream to Gleasons Landing, a distance of about seven river miles, was designated as "quality fishing waters" and special regulations were enacted. Again, this area offers excellent brown trout fishing, and in the spring is teeming with spawning steelhead. The upper reaches of the mainstream offer a very good trout fishery. Tributaries of the mainstream including Danaher, Kinney and Weldon creeks offer good spawning and fish habitat. The lower reaches of the mainstream beginning near the Village of Custer and the Big South Branch downstream are where warm water fish species predominate. Except for the spring and fall steelhead, sucker and salmon runs, pike is the most sought-after target.